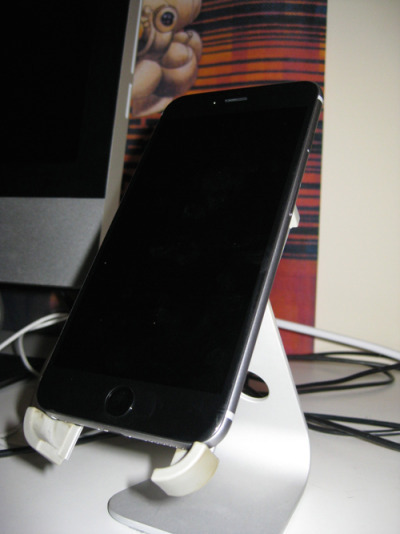 I wanted to share something about a new phone upgrade experience and how it can improve my creative workflow, or even anyone. I had an iPhone 5C with 16 GB memory which was nice and portable to carry around, saving me a lot of time taking images in and putting them on Dropbox. Then, the files were only to be fleshed out on my desktop once I get back to my home studio. But it's also a extremely handy way for me to communicate via text or FaceTime/Skype with other people on a moment's notice, depending on the signal bandwith availability. What annoyed me most from the previous phone was the keyboard causing a lot of typing errors and because I have " gamer thumbs " ( from gaming over the years ), the keys were small that required careful texting. For the most part, predictive text was useful but often times, it would result in words I did'nt mean to put out. Most iphone owners would know exactly what I'm referring to. I had been waiting for Apple to wise up and widen the keyboard. It was not until when Apple finally released the iPhone 6 Plus, that's when I said to myself, " It's about time the keyboard got enlarged! ". It was THE phone they should have released more than a year ago besides the iPhone 6. Although, I have nothing against the Android platform and am impressed with what the latest OS can do these days, especially the Galaxy Note 4. But what about the apps, you say? I'll get to that soon. Recently, I managed to snag an iPhone 6 Plus with 16 GB of memory which I chose because it was the cheaper model. I did'nt want to go crazy with 64 or 128 GB of storage and had no need for that space, to discipline myself in focusing on a select number of apps to work with. After all, smartphones do have a lot of very distracting features. It's one reason in which today's professional creative struggles to stay focused in this fast paced world and information overload, to which the challenge is blocking or filtering out the 'noise' is not easy. Having astigmatic vision in my eyes, I struggled somewhat with the small text on the 5C model which is another reason I got the 6 Plus for screen real estate and higher pixel resolution. It has one of the clearest screens I've seen besides the Galaxy Note 4. The 24 hour battery length for the 6 Plus was also a great improvement, knowing it would last me more than a day under a single charge, depending on the usage. I traded my old device in, valued at $200 with the buyback offer and paid only about $99 plus tax for the new one. Not a bad deal, I must say, for a $299 phone. I could have gone Android but chose not to so I can continue using the apps and data that were important to me. I think within two years, I will probably change to a new OS and that depends on how much Apple will continue to shoot itself in the foot in the future. Where I live, the state just banned texting while driving, so using a hands free approach was required. I've been using Siri lately and, while not quite perfect as it is, the virtual assistant does a nice job sending simple text messages via voice command or looking up NBA scores on the go while I drive. And using the GPS navigation on the road was surprisingly pleasant, especially if one uses voice command to request a location to be guided to. It's pretty cool. Now to the subject of apps for professional work, I think the iPhone 6 Plus is an ideal device due to the high resolution of 1920 by 1080 pixels using the camera features to snap image references on the go or short video clips. The slo-mo feature is also a nice addition which I never had before. There is value to the slo-mo, in my case, if I wanted to take a short clip at a fencing tournament which would be great in studying certain form and techniques in a bout. Here are some of the apps I use for the iOS platform. Some of them were used extensively on my original iPad but lately have relied the iPhone for these excellent tools. 1. Minimal Folio app. I use it to present my portfolio with anyone who wanted to see my illustrations or design work for a couple years now. It's clean, direct and cuts through to the chase. And it looks even better on 6 Plus screen going at 5.5 inches with such a clearer look on the images alone which is very important to me. Why use a small screen if one works in such great detail? That was part of my thinking behind the upgrade. I even use the Documents app ( Readdle ) to store PDF documents or images, if need be which is another reason where I can share files with clients over Dropbox or email attachments from there. 2. Scanbot. It's a godsend which allows me to archive files in Dropbox. Again, the 5.5 screen size is a great reason to be able to view a large scan without having to scroll or zoom too much. I can scan in drawings, receipts, printed letters and such for future reference. 3. Shake app. This app lets me create or customize contractual agreements. It used to be a bit challenging reading it on a smaller screen. When I tried it on the new phone, the text popped out even more. I really appreciated the ability to see and customize the contract in clearer fashion without squinting. Even using my finger or stylus to write my signature virtually was made very convenient. 4. Adobe Color. This one allows me to capture colors live from a camera and save/export them to my desktop for more visual experimentation. Or to accurately use a color for a certain project. A very handy tool. 5. iA Writer. I love this note taking program that is minimal in design, allowing me to focus on the text than the format itself. I can open it via the Cloud to my iPad or to my phone. It's been my old standby tool for jotting down notes or detailed ideas on the go for the last few years. Love it. The 5.5 screen for the phone is even nicer to see more body of text without too much scrolling around. 6. 30/30. This one is fully customizable which I can time-manage my work, break, or any other activity. A great way to use when one needs to focus on a tight deadline. I recommend it for anyone who's serious into time-management and it's no wonder why it's one of the best designed apps out there. 7. Dropbox. This one is obvious. For any creative professional, this is very handy. It's much more customizable than Apple's iCloud. Microsoft's OneDrive is another great alternative to look into as well. 8. Documents. This one is a great alternative to Dropbox as a complementary tool. It can't hurt to have it since it actually can open and read a PDF, or any other file format. It can work with any Cloud service. It's one of the nicer file managers I've had the pleasure of using. Especially useful when saving important documents such as scanned receipts. medical forms, and such. 9. Wunderlist. This is one of my favorite ToDo/Reminder list apps I've used and it also syncs with the desktop version if I wanted to view it on the other end. I've had a good experience with it as it lets me make a list of projects, books, movies, or anything I can think of. 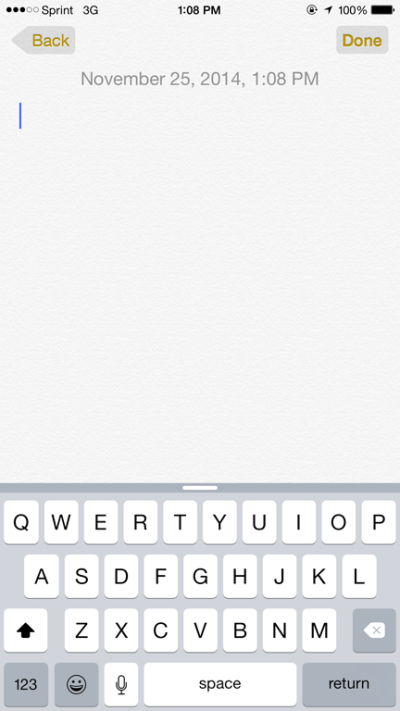 I think it's a lot more elegant than the Reminders app. Some designers I've heard swear by it. 10. Pinterest. A great app to curate images for references and ideas. Many creatives swear by it and I have been on this site for several months now. It's awesome as it looks so much better on the 5.5 screen. 11. Video Compressor. For those who shoot video clips on the phone or tablet, I recommend this to save space on memory. It does exactly what it's supposed to do. 12. Procreate. This illustration/painting app has been one of the most popular apps by artists and creative professionals. It's as good as Sketchbook Pro on that level with a beautiful UI. I use both of them on my iPad but lately it has been long in the tooth, so I've been looking to upgrade to a new tablet some time in 2015. But with the iPhone 6 Plus's screen, it makes a great mini sketchbook on the go to work out conceptuals. 13. Sketchbook Pro. There's no argument that it's nearly the number one most popular illustration/sketching app of all time, besides Procreate. I swear by both of them and used it a lot on my 1st gen iPad. I'm considered adding it to my phone for a better experience now that it's runs on the latest OS. I recommend this tool for any artist as it can export files to anywhere, even Dropbox. I already have the full version on my desktop which has more features than the iOS platform and more flexible with my wacom tablet using a pressure sensitive pen. 14. Zen Brush. This app allows me to loosen up and get creative with brush strokes. It's a beautiful app and emulates the ink in realistic fashion. I recommend using a stylus for this. I also have Adobe Ideas app which uses a stylus to sketch out conceptuals and copied it into my new iPhone. The first time I tried to open it, the app crashed every time. So with the update of 8.1.1, this solved the problem and it works now. I still need to get a new stylus to replace the one I lost. It appears to be an older app as Adobe Illustrator Draw is replacing it in some way under the Creative Cloud format. In addition with the popularity of webcomics on the internet, the use of tablets and large screened phones makes it a lot easier to follow the flow of the sequences of panels. It's the one thing I forgot to mention because it's also a part of storytelling aspect of illustration I appreciate and I subscribe to Taptastic which sends me a feed of selected webcomics I follow with an app. Some of the stuff they do on there is incredible and formatting is excellent. It's been a couple days since I've been using the 6 Plus and miss the portability a bit, but realized that there are trade offs when using a large phone. I won't go into details with the specs since anyone can look them up. Ultimately, it was really about my ability to read comfortably and text without the discomfort of a cramped screen. When tapping on the home button twice lightly, the screen drops down for the thumb to reach the top row icons or buttons which is a nice benefit without having to shuffle the phone with my fingers. With the die hard habits of a gamer, I still use two hands to text and this virtual keyboard's size was one big reason for this. To this date, I have not tried the NFC Apple Pay yet but I suspect that using the Thumb ID with Paypal, I can make such transactions with clients or using it at stores that accept this technology. 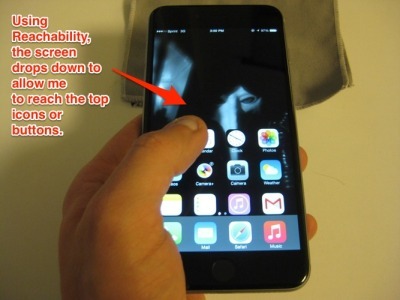 The Thumb ID is a speedy way for me to unlock the phone or use the passcode if I chose to. The large 5.5 size may not be for everyone and some will choose to stick with small portability. And that's cool with me. I think the large screen works well for those who are in the design or visual arts industries to capture or jot down ideas, or to exchange files on the go with other peers and clientele. To be fair, Android is also another good alternative to consider for those who prefer customization, especially the new Windows phone platform. I've heard good things about Sketchbook Pro on one of the Samsung tablets which does a nice job with the stylus included. I have not tried out FaceTime or Skype on it, yet. But I suspect the experience will be much better for it especially when conversing with some of my friends who are deaf and use sign language on screen. Ultimately, it comes down to personal preference. I'm quite happy with the new device as it gets the job done for me. Since the early days of the Blackberry 7250 which I used to have, the keyboard for the iphone 6 Plus is much easier to work with. My fingers are getting used to working around it since the home button has moved to the right side of the device and not on the top. And because I'm on an Unlimited Data plan under a special program, texting and email is never an issue for me including other apps that use streaming data. Very handy. The only drawback is I can't make outgoing voice calls or face surcharges and incoming voice calls are completely blocked no matter what. So far, it's one of the best phones I've had in a long time. 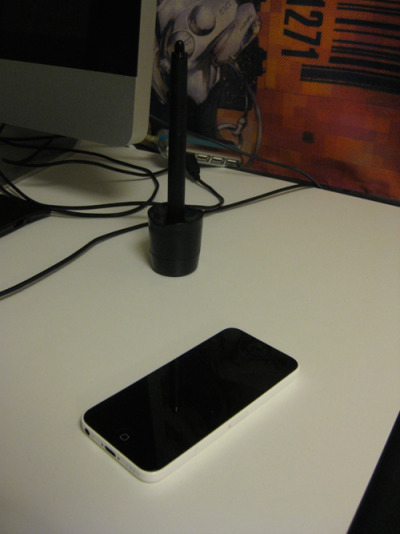 My old iPhone 5C aka The Stormtrooper iPhone 6 Plus on the stand. Looks pretty huge on my studio workstation. This is the back of it in Space Gray color. Reachability feature is quite useful. When the phone is flipped, the keyboard shows more features such as ' cut and paste '. So handy. 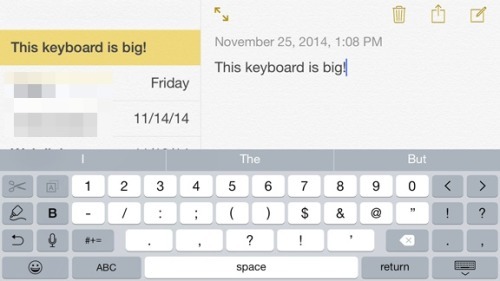 This is how big the iPhone 6 Plus keys look in standard position. Screenshot here is not the actual scale but it comes pretty close.